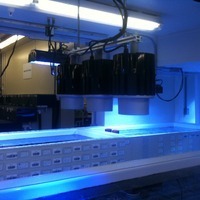 We recently reported that Sea Life Aquarium at Legoland is using the new Ecoxotic Cannon Pendants. Well, according to Ecoxotic, it seems that Kevin Kohen and the team at LiveAquaria are experimenting the same lights for their coral growing facility in Wisconsin. Replacing a 400K DE 20K pendant, LiveAquaria has elected to try 3 Ecoxotic Cannon Pendants, 2 455nm Blue & one 12K. The lights move over the large tanks with use of a light rail. It will be interesting to see if LiveAquaria starts a larger-scale shift towards LED use. 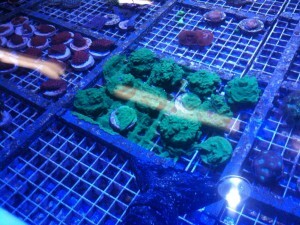 Just imagine if within the next few years ALL fish stores, hobbyists, and frag farmers made the switch to LED lighting. Not just for growing coral, but over their fish only tanks, too. It will be a HUGE step toward reducing this hobby’s energy usage! LED’s are the future!